A meet-up to talk about SXSW. Discuss how to get through a day of panels and parties and still keeping your particulars. 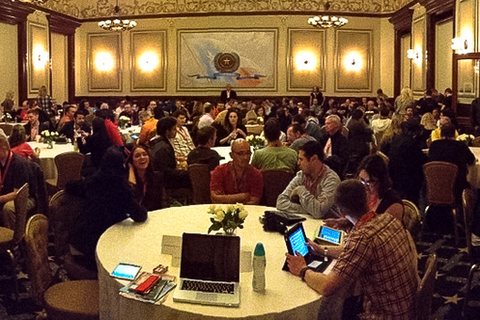 Tips on how to make the most of SXSW during one of the busiest panel sessions offered at a conference. Guidance on how to make the evening events fun, engaging, and productive. If there is a new technology he is exploring it. Always being intrigued at learning new ways to communicate comes from his youth. From the days of running a "BBS" on a Commodore 64 from the family phone line, helping people find their flights at the airport using the first wireless handheld device, or experimenting with social media in new and exciting ways he is always ahead of the curve. If there is a new platform to be evaluated he is on it, exploring possibilities, and trying to find unique ways that it can be used. Sweet John's experience with companies like SXSW, AT&T Wireless, and T-Mobile has given him rare insight into mobile technologies, experimental products, and the ever-changing world of social media. You will find he has a passion for the unexplored and an excitement for new products and concepts. Currently he is the Director of Social Media for SiteGoals, a digital design agency, here in Austin, Texas. In his spare time you will find him active in the XBOX Live community, taking photographs around town, or in the park with his two dogs.